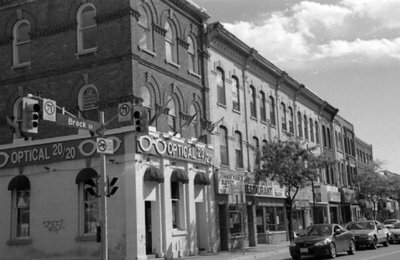 A black and white photograph of the east side of Brock Street South taken from Dundas Street. This block is formerly known as Watson's Block. This building was located at 101 Brock Street South (at the south east corner of Brock and Dundas Streets). It was built in 1874 and was the Whitby branch of the bank from 1875 to 1970. It was the only building in the block to escape destruction in the great fire of October 16, 1877. Brock Street South, October 2005, Carl Ferencz. Whitby Archives A2013_016_005D.